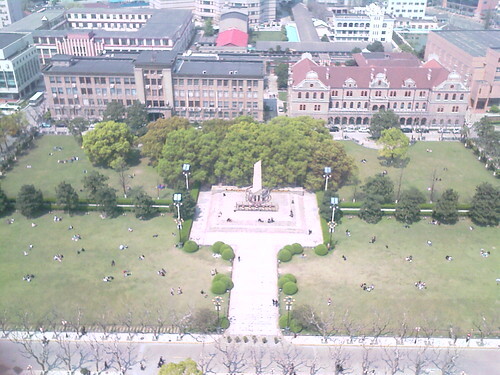 Today is the 111th anniversary of Jiao Tong University. Congratulations! If you look closely enough (well, not on this picture), on the surface of the monument, there are a lot of small stairs around it. On the back, the introduction on the stone said: “The 100 stairs reflects the 100 year history of the university”. Well. Next time, if you want to, count how many stairs yourself. The reality is, there are only 75 stairs on the monument! What a major bug of this monument! I suspect at the very beginning, the design was a monument like a square. Then the shape changed to triangle, but the design change was not reflected to the stairs, so…. I just came back to my dormitory from the party that was held to Celebrate the 111 Anniversary of SJTU. iam sonsulatant of studies in china i have agreements with nanjing medical university,Jining medical college and shinghai university i like to get contact with you if its possible.please reply then we can communicate more details.